After being away from this spot for a while, I return by asking you for a moment of personal reflection-privilege as they call it in Congress and parliamentary bodies. According to Blogger analytics this is my 1,115 post since I joined this part of the cyberworld in 2010. In 42 years of journalism and broadcasting work, jobs I loved, I was always a bit envious of the columnists, despite the fact friends who did that work said the demand was crushing. They were very good and eventually they phased from a daily deadline. Retirement was an adjustment for this adrenaline junkie hooked on deadlines, travel, the rhythms of news rooms, production suites, the board room, the corner office, corporate conferences, network and other negotiations and far flung producing and directing. At first, I must have driven a few friends crazy with my manic photo downloads as we explored our new and beloved California. One of them, Maura, a precocious, bright, world traveler and world class writer and story teller asked "why don't you write a blog?" Maura's idea coincided with my need to build a social media profile as I was finishing my third novel and laying the ground work for another. It was certainly better than napping. And so as I decompressed and adjusted from a life of motion, tension and decision making, I looked on blogging as my chance to be that columnist. In a parody of an old bromide, just like the holes in California sandstone, there are a million stories in retirement and leisure. Long time readers will remember this began as a daily effort. Soon I was disabused of that fanciful notion. But a new rhythm set in and with it became my sense of obligation and even purpose. This blog has won no pulitzers nor stopped a war, but it's had a seriousness of intent-at least from this side of the keypad. With time it has morphed to include social relevance, politics and opinion examination. And I know it has irritated some, including friends who think I'm a fuzzy headed polemicist. 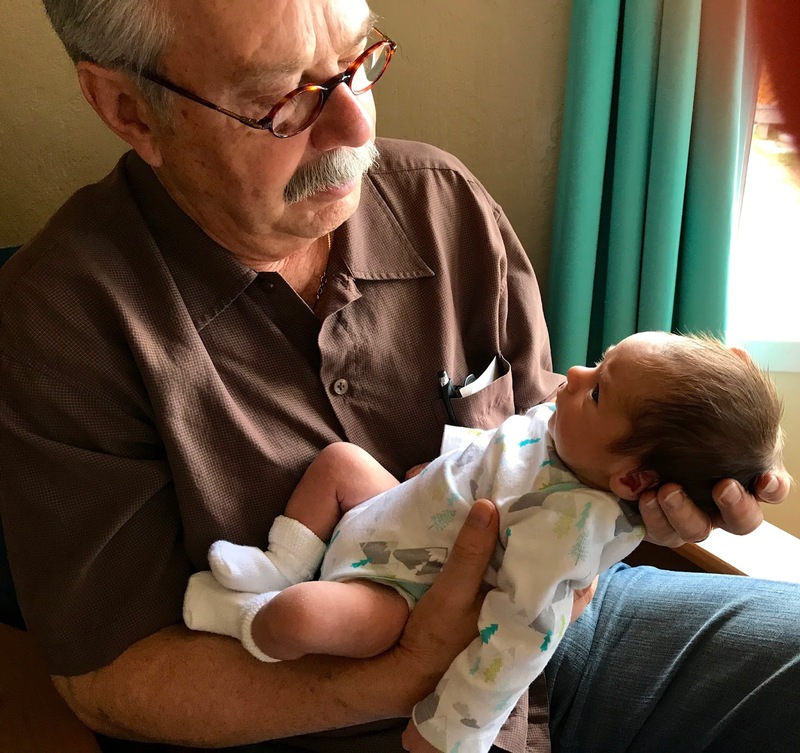 So with Lana's recent surgery, my own medical adventures, the arrival of a second grand child, the changes in the life of our eldest and her child's presence and obligations in the community, I've been variously occupied and have been pensive. We've spent time taking long views and pondering. A few years ago Bruce, the Catalyst of Oddball Observations and a long time friend and former newsie colleague asked why I cared or spent so much time on some of these topics. "Relax. Enjoy. You're retired. You can't do anything about it anyway. Our time has passed." He's right. We no longer have our hands on the controls, but I still care deeply about many things. But in this recent "ponder" I have come to understand it is not for my life span that I am concerned, agitated, motivated, inspired or active. No, it is for a longer deadline, certainly my daughters but even more so for the grand children. Lana and I are somewhat late to grandparent hood, so some of you have crossed the threshold already. Issues matter. Politics, policy, attitude, citizenship, leadership, war, peace, the environment, safety and health all impinge on their future. So until I'm beamed aboard a mother ship, or recruited into a tripping, smiley face, "everything is beautiful" cult, or join a revolutionary cadre of the Avengers, or get lost with a band of lotus eaters camping in the Elysian Fields, or hit by a comet, I may irritate or disagree with a few of you. It is my sincere hope that whatever intellectual product is left here, what ever photo images I capture of this life and planet I love so dearly, will be a record for my daughters and my grand children, a trace of what mattered to dad, pops and poppi, and perhaps an element of wisdom, warning, guidance or evaluation. I've come to think of this as a set of post cards from the past. You got it brother. It takes, as Webb Chiles put it, you need to be a "strong and tough old man" And you are. The old (and rapidly becoming ancient) Catalyst no longer shares your vigor but does share your worries/concerns about the future we are leaving for our grandchildren (in your case) and great-grandchildren (in mine) but then I think about all the dire times in this old world's history. And I am comforted by the realization that many generations before us lived through serious times too and still we as a race persevere. In the words of an old saw: it's just one damned thing after another. But keep spewing, brother, someone has to do it. For what it's worth I refer to other blogs I read as 'blogs'. Yours I call a 'column'. Keep it up pal. LOVE YOUR CANDOR. READING YOUR "BLOG" HAS ALWAYS BEEN A PLEASURE. I TRIED DOING MY OWN SEVERAL YEARS AGO, BUT RAN OUT OF STEAM, MUCH TO MY CHAGRIN. BUT I DIDN'T STOP WRITING. LOOK SOON (I HOPE TO HELL) FOR "THE CURSE OF LUCKY JOE GERMAN" (NOVELLA) AND "MAX IS DEAD" (NOVEL). When are you making your return, I enjoy reading your blogs. I may not always agree with you on some things but you do make many good points.